The Douglas family just wants to live their lives, and maybe find a bit of happiness. But when the ghost in their home breaks out of a centuries-long sleep, all hope for happiness will die. Because the thing that haunts them is not just evil… It is something much, much worse. Watching them from the shadows. Hungry to start killing once more. And thirsty for the blood of the children, the blood he has so long been denied. The thing that haunts them is not just evil. It is twisted. 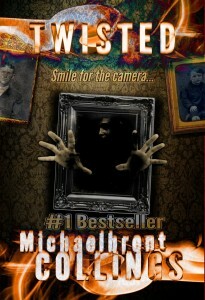 TWISTED is available from Amazon, Barnes & Noble and Kobo. Michaelbrent Collings is a #1 bestselling novelist and screenwriter, and one of Amazon’s Most Popular Horror Writers. His bestsellers include The Colony Saga, Strangers, Darkbound, Apparition, The Haunted, The Loon, and the YA fantasy series The Billy Saga. He hopes someday to develop superpowers, and maybe get a cool robot arm. Michaelbrent has a wife and several kids, all of whom are much better looking than he is (though he admits that’s a low bar to set), and much MUCH cooler than he is (also a low bar). He also has a Facebook page at http://www.facebook.com/MichaelbrentCollings and can be followed on Twitter through his username @mbcollings. Sign up at http://eepurl.com/VHuvX for advance notice of MbC’s new releases, sales, and freebies. You will also be kept safe when the Glorious Revolution begins! MWA-hahahahaha!